For years I kept a dusty Mason jar, filled with home-bottled cherries, on my kitchen shelf. I have no idea how the jar arrived in my kitchen. I do know that I have never bottled cherries, and I know that my family would never eat the fruit. And yet, the jar presided over years of holiday meals and fresh bread, hurried breakfasts and midnight snacks. Perhaps I hoped that it would lend a sense of pioneer wholesomeness and a promise of home-cooked love that would settle over my family. For me, personally, the cherries brought a touch of my childhood to my adult life. Growing up, canning season was a bustling reality at our house, following on the heels of gardening season. As autumn approached, Mother alternated between sewing our school clothes and minding the jars rumbling away in the canner on the stove. She bottled applesauce, pears, pickles, peaches, tomatoes, and whatever fruit was native to the area we called “home” that year. When our travels took us out West to visit family, we gathered cherries from the orchards in central Utah. 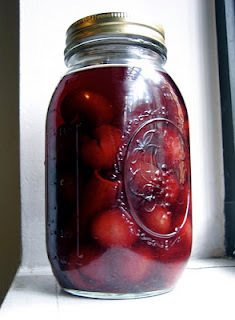 I never liked the taste of the cherries as much as I liked the chunky applesauce and the bread and butter pickles, but I loved the way they looked with the rich burgundy of the cherry juice. And I loved the vacation memories they brought. As my children grow older and my confidence in my nurturing skills dwindles, my own mother rises higher and higher on the pedestal of ideal motherhood. I struggle with the daily grind of cooking and remember family dinners and trays of fanciful holiday treats on New Year’s Eve. I sigh impatiently when my younger children want to play a made-up game, and I remember Mother playing ball with me in the park and making a special tent to go over the card table. I explain to my teenager that I cannot possibly manage all of his activities along with my own, and I remember how Mother used to drive me across town for ballet three times a week. I will never be the mother to my own children that my mother was to me, just as I will never eat that dusty bottle of cherries. But the ideal still presides over my kitchen thoughts and colors my dreams.